Filed Under Everton F.C., Leicester City F.C., Liverpool, Manchester City F.C., Manchester United FC, Premier League, Spurs, West Bromwich Albion F.C. 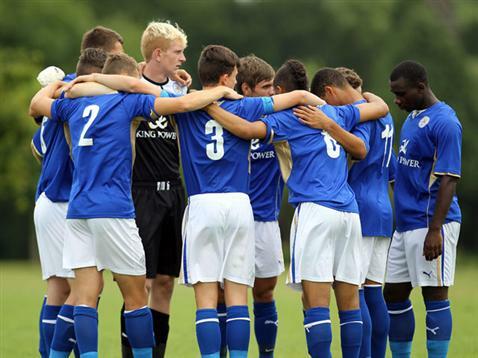 Leicester City under-18s caused the shock of the weekend. The big shock of the weekend came at Belvoir Drive as Leicester City beat Spurs 3-1. It was only Tottenham’s third defeat of the season while Leicester picked up just their second win, leaving them third from bottom in the Barclays U18 Premier League southern division. Leicester took the lead as Ben Chilwell’s cross found Spurs’ Connor Ogilvie, who converted the ball past his own goalkeeper after 25 minutes. It was 2-0 before half-time as another cross caused mayhem in the Spurs defensive ranks and Danny Rowe headed home after a terrific leap. Keenan King came off the bench to give the Foxes a 3-0 lead and Anthony Georgiou finished a neat move to grab a consolation for Spurs. Manchester United beat Everton at the summit of the northern division to take top spot off their Merseyside rivals. It was Sean Goss’ late winner that gave the Red Devils all three points to overtake the Toffees. Andreas Pereira netted a first-half penalty to give United the lead before George Green also struck from the spot five minutes from time to equalise. Goss grabbed his goal and all three points for United in the final minute when Joshua Harrop’s shot was saved and he was there to convert the rebound. Man City 4-1 Bolton, Man Utd 2-1 Everton, Stoke 0-3 Blackburn, Sunderland 1-3 Liverpool, Wolves 2-1 Middlesbrough, Arsenal 0-3 Chelsea, Aston Villa 5-4 Norwich, Fulham 3-1 West Bromwich Albion, Leicester 3-1 Tottenham, Reading 1-3 West Ham.